1. 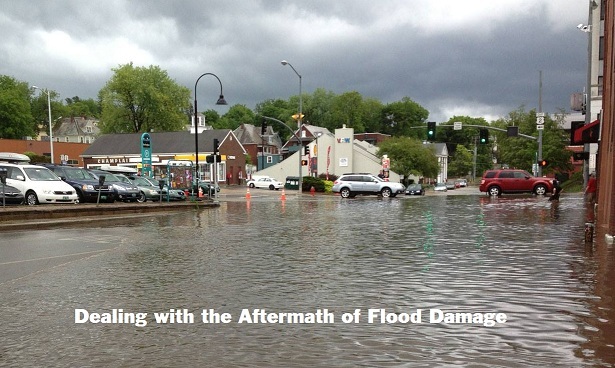 SAFETY FIRST: Moving water is a very strong force, and continues to pose a risk once settled. Never enter a flood damaged building before making sure that the structure is absolutely sound. If there is standing water inside-CALL THE POWER COMPANY IMMEDIATELY. Never risk entering an area where wires and water may be touching (don't forget that furnaces and boilers are often run by electric power and in basements-common flood zones). If you are in any way doubtful of the safety of your home, call in an electrician before cleaning up to be sure. Also keep in mind that flood water could be contaminated with sewage and other bacteria--wear rubber boots and protective gloves to keep yourself safe. 2. Circulate The Air: Once the home is cleared for safety, set up fans wherever you are able to keep air flowing. Open windows and doors to further aid in drying out the home. 3. Remove As Much Water As Possible: If there is standing water in your home, use a shop vac or pump to remove as much as you can. Getting the excess water out as quickly as possible is crucial to salvaging your property. 4. Dry The Home: Mold begins to grow between 48 and 72 hours after water has entered a home. This becomes especially problematic when the air is humid. Shut your doors and windows and run a de-humidifier to continually remove moisture from the air. This will also sap moisture from wood and help maintain its integrity. Remember to wear a mask and gloves during this stage to protect yourself from mold spores. You will need to remove any carpeting, mats or drywall damaged by the water to prevent any further damage and potential mold growth. 5. Clean Up: When you have removed all of the water and damaged materials, mix up a solution of hot water and bleach to clean all surfaces touched by the flood water. As mentioned earlier, the water could be contaminated with bacteria, so a thorough cleaning is critical for health purposes.